Emboldened by their ability to openly attack students and clergy in Charlottesville while the police look on after having been ordered to stand down, white supremacist organizations seem undaunted by even the negative press that their murder by sports car finale got them. A series of threats against anti-racist demonstrations on August 19th for those nazis who could not make it to make it to the “Free Speech” Rally on Boston Commons. This is to be followed by another series of nazi rallies on August 28th, centered around a “March against Marxism” to be held in Berkeley. Across the country the Saturday and the previous week have seen police attacks in an attempt to assist the White Supremacist movement by attacking their opponents. Boston saw a police riot, shown above, but was not the only incident of clear police favoritism to neo-nazis. With the exception of James Alex Fields, who murdered Heather Heyers and wounded 19 other people with his car in Charlottesville, no white supremacist has been arrested for any violence they have been filmed committing. The liberal democrat Berkeley California city council moved preemptively to suppress the free speech of everyone but white supremacists by passing a city ordinance prohibiting people from being in public in groups larger than three during the nazi rally planned for this coming Saturday. Thus a family of four could be arrested for being in any park because they might interfere with the right of neo-nazis to express their need to gas people and put the in ovens. They must have gotten advice from the ACLU, who acted quickly to provide a defense of neo-nazi murder just eight days ago. 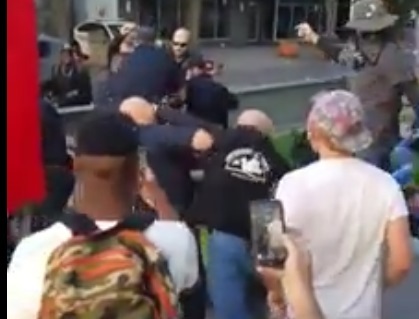 While nazis have been filmed beating clergy with pipes, macing students on their own campus and being defended by centrist moral equivalency arguments, 8 protestors who took down a confederate statue in Durham North Carolina have been arrested. Apparently in the slave states of the old south, a statue of a dead slave owner is worth more than the life of a living person to the police. This action was echoed Saturday by the arrest of 6 more people in Memphis for attempting to merely put a sheet over the statue of Confederate General Nathaniel Bedford Forrest, who founded the KKK after the final defeat of the Confederate armies. Statues of the founder of the Klan have more rights than actual human beings. While Southern police reaffirmed their commitment to heritage in passing out Southern hospitality at a rate of eight to a holding cell, in Boston the cops of the deep North would not be undone. While the mainstream news media under reported a crowd of 45,000 as 20,000 they did not report the Police riot on the commons. Columbus Ohio police would also not be outdone. While Bannon is out of the White House to advise the president from across the street, Jeff Sessions department of Justice will no longer be investigating police departments for patterns of brutality. He will be trying to find every single anti-fascist in America and target them for punishment, as police departments continue to act on their own to defend white supremacy.